This is the most fun in a radio I have. I say this because I love to search and DX in radio and the tuning in of a station is most of the fun. I can't stand digital tuning for DX'ing. So when I can pull in a station from N.Y.C. or Miami or Chicago or Kentucky or Ohio anywhere over 100 miles by manually analog tuning it I have the most fun. 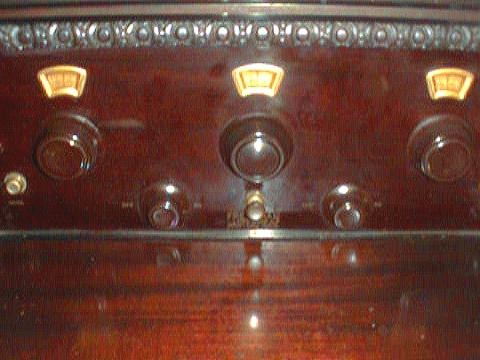 While my other superhet single tuning knob radios can do this easily, there is a certain excitement in being able to do it with three knobs and a primitive TRF circuit. One can get no more primitive than the Freshman Masterpiece. Except with a home brew TRF of the time, which I had but was stolen along with the car that it was in. 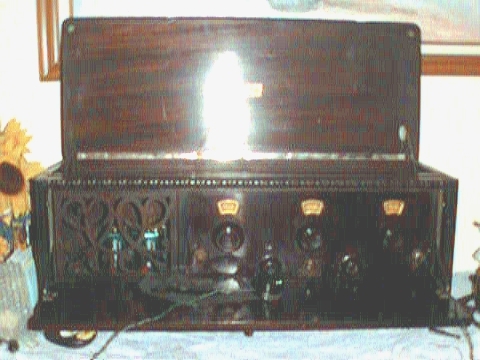 This radio from 1926 is a five tube model using UX-201a's or UX301a's, depending on whether you used RCA or Cunningham tubes, respectively. But they are actually the same. I recently bought five of them from a fellow for $65 U.S. for the set! It originally came with three. I had to use a UX-371 I scrounged from another (the Bosch) radio in order to use it. Now they are spares. This radio, like, and unlike, about three others that I saw elsewhere on the 'net, has a door that pulls down to reveal the face with the three tuning knobs, two filament control knobs, and a power switch that turns on/off the filament power. There are also two 1/4" phone jacks, the one on the left for an external horn, and the one on the right for a headphone jack. the other three have these but not the door. There is also the opening on the left for an internal speaker. Of other three I saw two of them had the opening and the speaker (lucky dogs!) and the other had no opening for the speaker. One of the two had the opening for the speaker and was built into a radio stand. The other had no stand nor front door. All four (incuding mine) are 1925/26 models with the five tube design. If you are interested in seeing theirs, I will have a link to them here soon. On the RCA page I mention a fellow who would have charged me $100 for a 6A7. He would have charged me $90 apiece for the UX-301a's. I guess he could have actually had NOS, but I didn't trust him. Anyway, this radio uses "specially designed" audio interstage transformers that are supposed to eliminate the "C" battery. But for some reason they are not working so well. I read on another site that they do go bad. I intend to bypass them since I do not know where to get others, and install C batteries to set the grid bias so I could use all five tubes with the horn I recently acquired. I will do this by disconnecting the secondary winding (assuming that the primary works) and capacitor couple the previous stage with the next stage to get further amplification. If worse comes to worst I could always rewind the transformers. UPDATE ON ABOVE PARAGRAPH: I have recently built an A battery eliminator. It works much better now. That plus a fresh set of batteries for the B supply makes this perform on both RF and audio amplification surprisingly well. I get alot of stations and very clearly. The amplifier now puts out annoyingly loud sound through the Radioceiver Horn. It is now difficault to lower the volume. But this is a good thing! Selectivity is also surprisingly good. I will soon also make a B battery eliminator. It should outperform itself then. With the A battery eliminator I can use a UX271a tube in the output which gives a little more volume, too. Anyway, I think it was pretty neat that they were able to do this, eliminating the expense and need for an extra battery. If only they knew about cathode bias! This is the way I got it. No internal speaker. It had an option for the internal speaker, though. The thing you see on the front door is the headset I have been listening to it with. 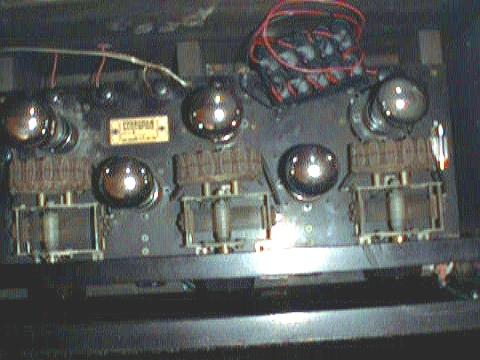 Looking through the speaker grille you can see two green heavy duty 6 volt lantern batteries. They are only really good for about an hour of use. The filaments really eat up a lot of juice. I have since added in parallel another two. The set works better now for about the same amount of time. I am in the process of making an AC power supply for it. The batteries are now inside of a radio table I recently (obviously after this picture) purchased for it. I also now have a horn. This is the inside. Notice the silvery thing on the center right hand side of the picture? It is supposed to be some kind of resistor. What was supposed to be there was a variable 20 Megohm adjustable by a slider resistor for grid leak detection. Also on the upper part of the picture you will notice my 90 volt "B" battery made up of ten 9 volt batteries, tapped at 45 volts for the detector. It is also now in the radio table. This is the tuning array, with two controls for heater voltage and an on-off switch. There is a 1/4 inch jack on the left for an external horn, and one on the right (not shown) for a headset. The escutcheons for the tuning are actually plastic, leading me to believe that they were replaced recently. I doubt that they had plastic like that in the twenties. But if they did and it was cheaper, I guess that Mr. Freshman would have used it. Actually, the knobs are plastic too, so who knows. Click on BACK above to return to the Antiques Page.